Heritage architecture and an exquisite design combine with strong facilities and thoughtful service to make AriyasomVilla stand out in Bangkok’s upscale accommodation scene. With an intimate feel that’s similar to smaller bed and breakfasts, the hotel has enough space and extras to be called a small resort. Those who can afford to stay here will be soothed, pampered and intrigued. Average rating 9.1 from 489 reviews. 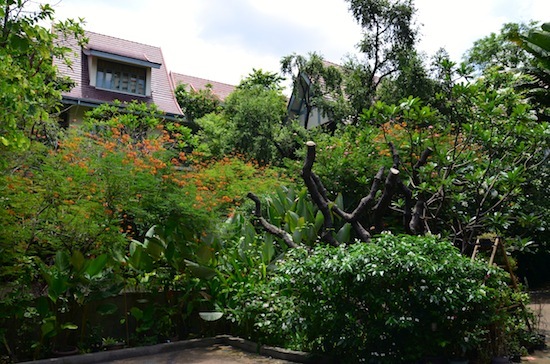 A garden like this is very rare in Bangkok. The gorgeous three-storey mansion was built in 1942 by an English-Thai engineer who served as dean of engineering at Thailand’s most prestigious university while also designing the National Stadium and parts of Don Mueang Airport. In 2008, his granddaughter joined her English husband to convert the well-preserved building into the one-of-a-kind hotel that you see today. Set alongside the San Saeb canal at the far end of a fairly quiet side street, Ariyasom’s extensive tropical garden is most welcome after passing through concrete-covered lower Sukhumvit. With high gabled roofs, tall swing-open windows and subtly elegant trim, the building hints at what life would have been like for Thai aristocrats in the mid 20th century. We’ll take this over the Four Seasons any day. Greeted by a polite and helpful staff member wearing a traditional Thai white-cotton shirt, we were quickly led to a modern lift and ascended to an upper floor. Recycled teakwood floor boards, high ceilings, antique furnishings and intricate lai Thai carvings adorned the hallway. A peak into a couple of rooms left little doubt that Ariyasom is a class act. One of two rooms in an executive deluxe. 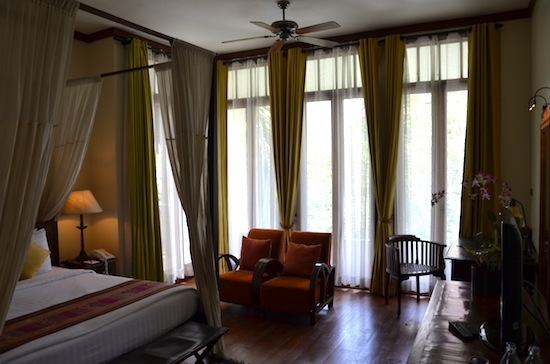 Though all of the expected mod-cons are included in all rooms, the teak furniture, antique ceiling fans, fresh-cut orchids, warm-colour silks, wall-size windows and private terraces overlooking the greenery all serve to perpetuate the original ambiance. 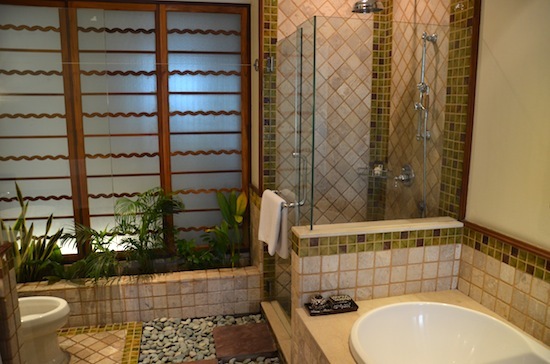 Enormous bathrooms boast tropical plants growing beside loose stone floors that taper into rain showers and Jacuzzi tubs. Bathing in style in a deluxe room. The least expensive studio rooms are spacious and cushy, while the deluxe gets you extra room and a sofa. The stunning executive deluxe comes with a separate living room and romantic four-poster bed. While we didn’t get a chance to see the executive suite, we’d happily wager that it’s right up there among Bangkok’s top picks for honeymooners. All rooms include breakfast, daily newspaper and a fruit basket, and discounts are offered for stays of three nights or more. An airy ground-floor room hosts the terrific Na Aroon Restaurant, which serves only seafood and vegetarian cuisine featuring fresh organic produce. Overlooking the long and narrow swimming pool, Som Sen spa is set in a Thai-style pavilion with an open-air massage area and attached fitness room. A top-floor meditation hall hosts weekly sittings with the Little Bang Sangha, led by an English Buddhist monk. Like an unexpected dessert on top of an already excellent meal. 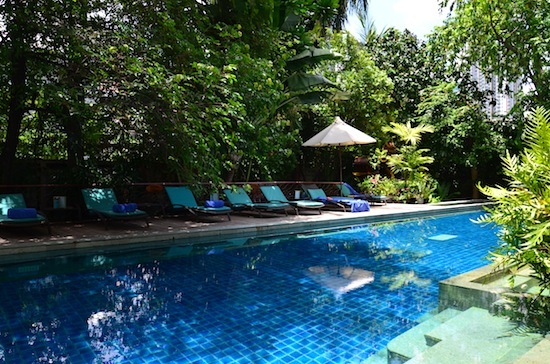 Ariyasom is located at the end of Sukhumvit Soi 1, a reasonably quiet street with no seedy bars or “massage” parlours. Phloen Chit BTS skytrain station is about a 10-minute walk away, and a khlong boat pier is just a few steps from the hotel. These provide fairly easy access to nearby shopping and nightlife areas, with the historic district reachable after a longer ride. If you like this area but would prefer modern-style accommodation with slightly cheaper rates, nearby Ad Lib Hotel is a solid choice next to Bumrungrad International Hospital. 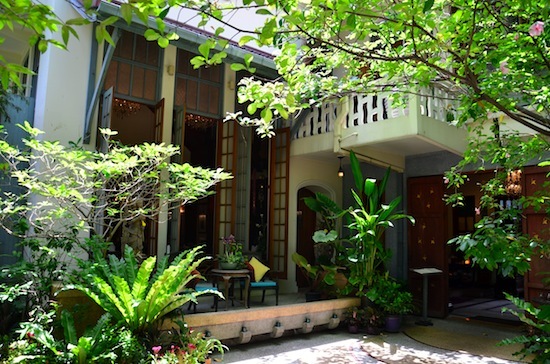 If you seek a heritage bed and breakfast but would prefer to stay in the historic district, consider the Old Bangkok Inn, Arun Residence and Baan Noppawong. Check rates at AriyasomVilla on Booking.com. 6,880 in peak. Executive deluxe: 7080 baht low, 8330 baht high, 9,350 baht in peak. Room: Deluxe double room, low season: 5,300 baht, high season 6,250 baht. Notes: 6,880 in peak. Executive deluxe: 7080 baht low, 8330 baht high, 9,350 baht in peak.